This was a manga that was recommended to me by a really great friend. I have to say that i do not read many mangas but the ones that I do are always recommended by friends and are all ones I end up loving. A Silent Voice Vol. 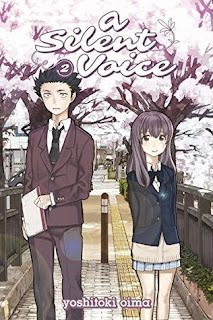 1set up the story and this volume continue the story but started to add more depth, more backstory, and an building love for the overall series. Continuing with Shoya and Shoko we are now five years in the future and both characters, yes have grown, but are still tied down from the past. However, since their encounter Shoya seeks everything that he can to gain forgiveness not only from Shoko but the people who too were also hurt from his bullying. Shoya is still warming up to me. He has not fully redeemed himself and even though he is willing to learn sign language so that he is better able to communicate with Shoko, one must wonder though if his intentions are within good reason. However, as the book continues he becomes more and more persistent. Making continuous efforts to make amends everything seems to be going okay. But then what appears to be the boyfriend arrives? Mangas are already a fast-paced read for me but the series has proven to be, although fast, really enjoyable. The characters feel real as well as the story. I am sure this what you are supposed to be feeling but this second volume was an enhancement to Vol. 1 and I found myself falling more in love with it. The author still brings to bring up heavy topics as it relates to teenage bullying, acceptance for the deaf culture as well as the struggles of finding forgiveness with others as well as themselves. The author writes a story that teens are able to connect with on a personal level. I am excited to continue this story and see where this unlikely path of forgiveness with take and if Shoya is able to receive forgiveness or will his past be the reason to everything back. if you are looking for a light but necessary new read, check out this story.